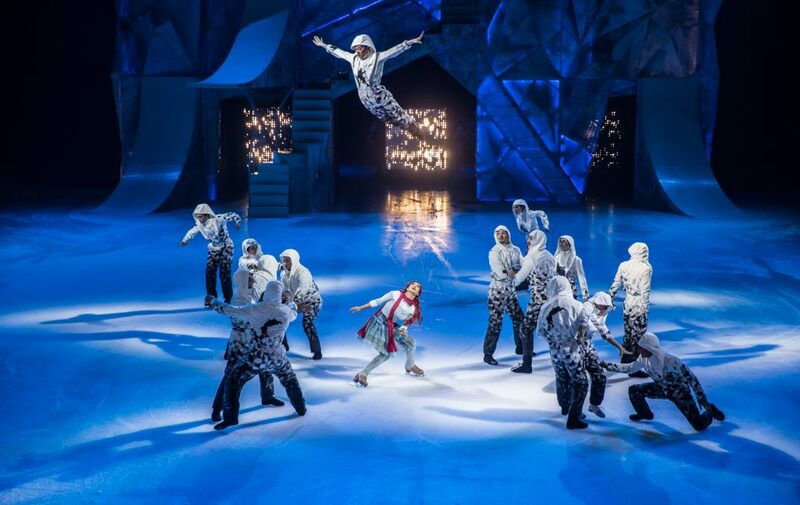 Cirque Du Soleil’s “Crystal”–a magical circus on ice–branches out into a cool realm of music and light displays. “Crystal” breaks through Cirque du Soleil thrills into a spectacular circus world. 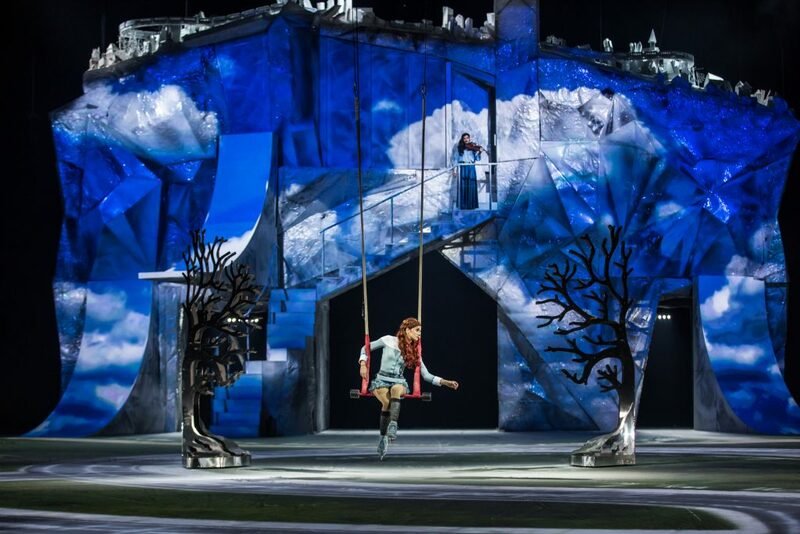 This old-fashioned circus promises nostalgia, re-fashioned for the ice–an old mystery, frozen and new. “Crystal” focuses on synchronized skating and dancing, worthy of Olympic medals. “Crystal” offers visually stunning sets with minimal props, concentrating on sharp lighting effects that paint the massive SAP ice rink in iridescent technicolor. Have you ever been to an electronic dance music concert? Think LED lights fused with classical artistry. We can choose between following the artistic projections or the corporate characters, ballroom dancing or a life-sized pinball machine. We join Crystal, a young writer, on her odyssey of self discovery, as she sinks slowly through a crack in the ice. With her blazing red hair, short blue skirt, white shirt, and trailing red scarf, Crystal reminds us of a prep school student. While she is swallowed up in the ice, an identical woman in a darker-toned shirt, is suspended from the ceiling. Beautifully lit ice powder sprinkles down on them both. The hanging girl makes a scary mirror-image of Crystal’s repressed imagination. Shadows follow the skater’s movements, as Crystal’s inner monologue reveals her secret destiny. HD Holographic projections surround Crystal, as she skates through grade school, college, a “real job,” and falling in love. When she lands her first big girl job, we see pop-locking corporate zombies in cool blue suits typing and tut-ing in time with an original hip hop/trap soundtrack, bringing style and youth to the show. Red LED lights dance around a lovely bald aerial performer with a red bow-tie, as he courts Crystal, the young writer. When Crystal finds love, she looks up hopefully at this aerial master, glowing as he scoops her up. He grabs and swings her up into red velvet aerial holsters. Together, they twirl as they lock eyes and melt into each other’s arms. 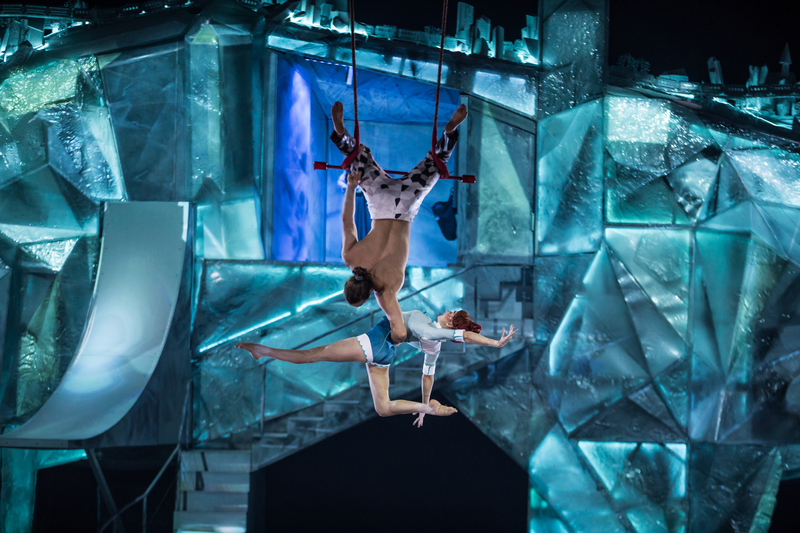 “Crystal” directors Shana Carroll and Sébastien Soldevila reinvent Cirque’s acrobatic acts and choreography, seamlessly blending in ice skating twists, jumps, and flips. All 15 acts are choreographed to spellbinding instrumental music, featuring swing jazz tunes, hip-hop, and adaptations of Beyoncé. Each musical number recounts a stage in Crystal’s creative evolution–it’s fun to follow. The music, lights, and choreography hypnotize us, but the thrill of the usual Cirque stunts are missing. 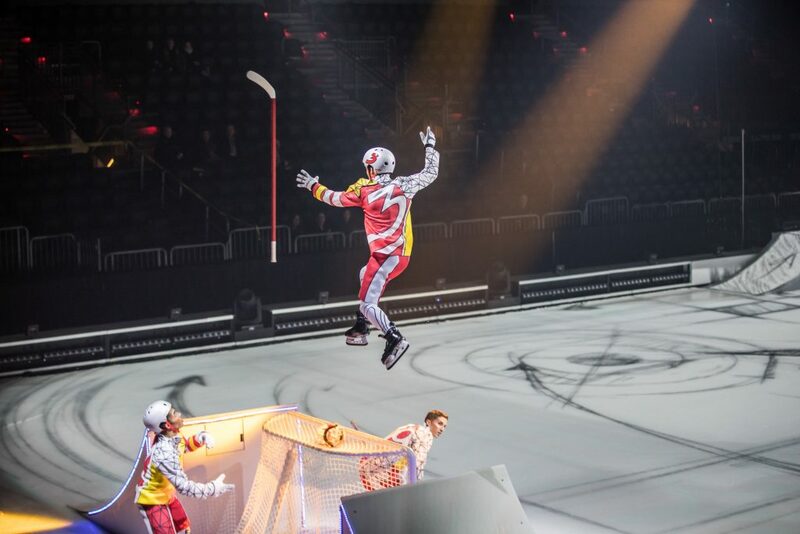 Cirque Du Soleil brings a full-on, traditional circus onto the ice. “Crystal” is not the usual Cirque fare. This time, they astonish us with traditional circus acts, a dash of Broadway, and Olympic grade ice-skating performers whizzing by.